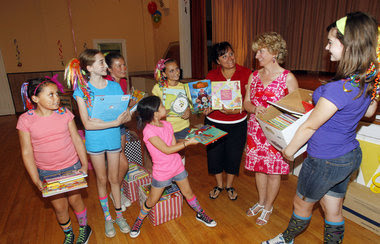 The Star-Ledger, NJ, reports that Girl Scout Troop 81158 of Edison and Highland Park initiated a program called "Girl Scouts Think: Reading Rocks" which the troop donated books to Menlo Park Terrace Elementary School. In mid May, the nine girls in the troop began collecting books at four locations. Today, members of Troop 81158 presented nearly 1,000 books to the library at the Menlo Park Terrace School 19 in Woodbridge. "It’s always a big plus to get an influx of books. They will benefit the school’s commitment to literacy and education," said school Principal Sharon McGreevey. The troop of junior girl scouts, ages 9 through 12, needed a project for their Bronze Award — the highest honor for their age group. Collection bins were placed at two Metuchen schools, the borough library and a church, where the books piled up. This past weekend, the scouts held a ceremony at the Reformed Church of Metuchen.